The number of available apartments in Bushwick has quadrupled over the last year. BUSHWICK — Average rent prices in Bushwick dropped 16 percent over the past year as the number of apartments on the market quadrupled, according to a report. Rents in the neighborhood went from an average of $2,485 per month in August 2014 to $2,090 in August of 2015 — a deeper drop than any other popular Brooklyn neighborhood, according to a report by real estate firm MNS. But the dramatic decrease was largely due to a huge increase in the number of apartments that went on the market last month, with available rentals increasing four-fold in the last year, MNS said. Plus, luxury rentals like 1209 Dekalb — where rent for a two-bedroom currently starts at $3,150 — went on the market around this time last year, spiking last August's average rental price, added Andrew Barrocas, CEO of MNS. Bushwick's rental market has grown so much in the last year that it's difficult to directly compare rent prices, he said. "There's a tremendous amount of demand," Barrocas said. "There's [now] supply to meet that demand." The surge in new apartments south of Myrtle Avenue or closer to the J/M/Z train may also be driving the average rent price decrease in Bushwick, Barrocas said. It's not as popular to live in those areas as it is to live near the Jefferson Avenue L stop, and rent prices can be as much as 10 percent lower toward the southern end of the neighborhood, he said. Despite the price decrease in the last year, the growing number of available Bushwick apartments doesn't bode well for people looking to keep their rent checks low. Much of the new inventory comes from landlords buying out tenants, renovating apartments or building new property all over Bushwick, including historically less popular areas, Barrocas said. Rental prices on newly available units in Bushwick are expected to steadily rise, he said. On a month-to-month level, rents in August rose slightly from July, with both studio and one-bedroom prices going up about 3 percent. Average two-bedroom rent prices stayed the same. Average rents plunged in September of last year, with prices in August 2015 coming in slightly above that mark. For instance, rent for a one-bedroom apartment was an average of $2,068 in September 2014, compared to $2,152 in August 2015. "The demand is there, for the younger demographic especially," Barrocas said. 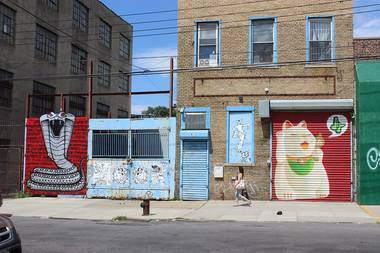 "People are getting priced out, and [those who] might have once gone to Williamsburg are going to Bushwick."